Which Programming Languages Should You Learn in 2018? It’s a valid question, but it’s difficult to answer without knowing more about you and what you want to achieve. What is your current web development knowledge? What is the purpose of you studying programming? Do you want to work for yourself or for a company? Do you prefer frontend or backend? How much are you willing to invest in learning? What are the most popular programming languages for 2018? When looking at different sites, the ranking of the most popular languages can vary, depending on the parameters you use for your calculation. 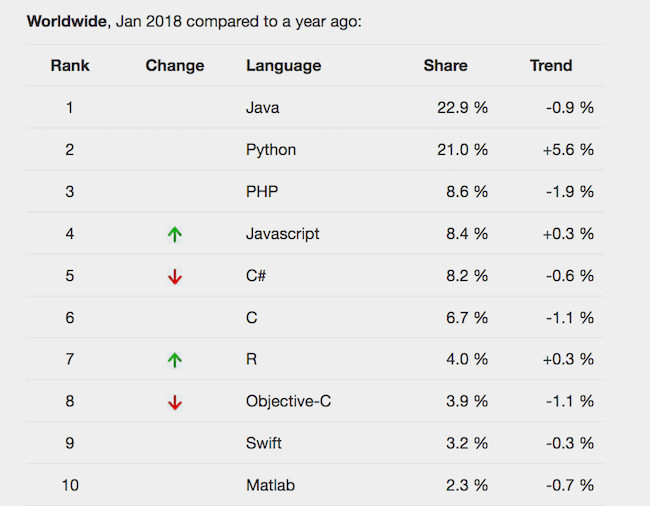 While Java is still #1, it is followed by Python and PHP. The PYPL ranking is created by analyzing how often language tutorials are searched on Google. As you can see: a different approach leads to different results. One last example, to illustrate my point. Ranking depends on what you are asking and who you are asking. That is something that you should keep in mind when using trend data to determine which programming language to learn next. We don’t want to give you yet another ranking, but instead, show you 10 widely used programming languages in 2018 and how people are using them. Have fun and don’t forget to vote for your favorite programming language at the end of the post. Sometimes we do need to call functions that have side effects, even in functional programming – e.g. when we’re talking to our backend. Often we even have multiple calls that depend on each other. First, there was callback hell, then came promises, and now async/await has come to make these things even easier. TypeScript offers great resources to learn their language in a short time. In their guide on How to Learn TypeScript in 5 Minutes they walk you through building a simple web application, from installation to running your TypeScript web app. Since many web development libraries are using TypeScript, learning the language is a great skill to have an investment in your career. Java is always a good long-term bet and looking at the stats, it doesn’t seem to be going away anytime soon. It’s used by over 10 million developers and 15 billion devices run Java worldwide! Java is used to create Android Apps, desktop applications, games and website content. Udemy offers some great classes to learn Java. Particularly, this encompassing course stands out. In the Complete Java Class you learn everything about OOPs, variables, exceptions, data structures, and generics. Over 180k people have taken this particular class to learn Java. Python is similar to PHP and Ruby in the sense that it is an object-orientated language. It closely resembles the English language so it’s a great backend language to learn for beginners as well as seasoned professionals for the more advanced things you can do with Python. Sites like Instagram, YouTube, Reddit and NASA all use aspects of Python. Python 3.6.4 is their newest release – look at the new features here. If you are just getting started with Python, a good resource is Python Crash Course: A Hands-On, Project-Based Introduction to Programming. PHP is the most popular server-side programming language. It’s often used as the foundation of CMS (Content Management Systems) like WordPress and big websites like Facebook and Wikipedia. PHP 7.1 was released recently – look at the features here. You can learn the basics of PHP at the PHP Tutorial from W3Schools. The tutorial offers an introduction into variables, arrays, loops, constants, and much more. Visually it is not the most compelling guide, but it is a standard resource for PHP and allows you to look up things when you are building your skills. It makes it much easier to use Ruby, but it’s advised that you have a good understanding of Ruby before you utilize Rails. The reason why Ruby on Rails is a great and popular choice is because many businesses (small and large) make use of it. Some businesses are: Airbnb, Groupon, Twitter, Shopify and Basecamp. If you want to learn Ruby, I can recommend Michael Hartl’s Ruby guide. This guide will get your from zero to deploy. What makes this tutorial great is that it contains a large number of practical exercises. Rust is a general-purpose language that helps developers create fast, secure applications which takes advantage of the powerful features of modern multi-core processors. 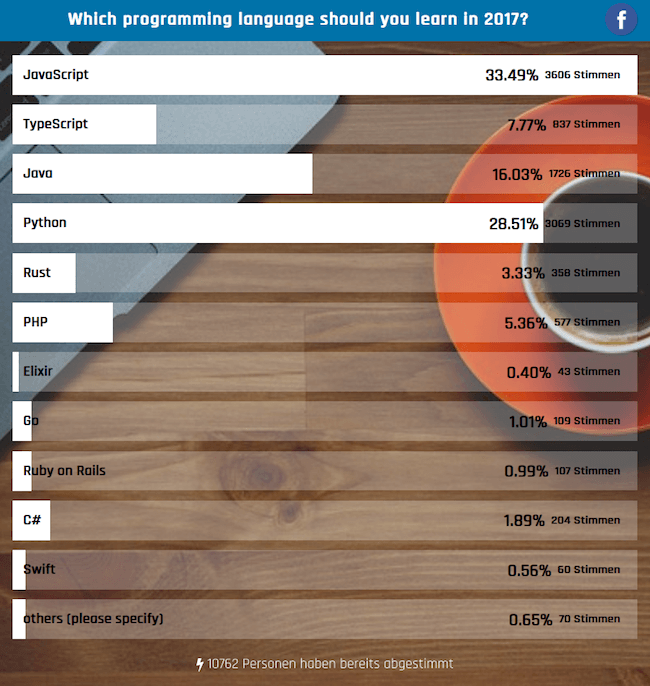 It’s also the most loved programming language on StackOverflow for 2017 which says a lot. Sites that use Rust are: Dropbox and Coursera. If you want to learn Rust, I would recommend to start with the official book that is now in its second edition. The authors are veteran programmers and know everything you will need to successfully use Rust. I also recommend to take a look at standard resources at Github. This standard library source will help you understand the design behind the structures you are using every day. Elixir is a dynamic, functional language designed for building scalable and maintainable applications. One of the main benefits is concurrency. In short, it’s great for large applications that handle a lot of tasks at once. Sites that use Elixir are: Pinterest, Moz and Bleacher Report. The learning resources from the official page are really great. The resources include video content, books, and screencast. If you are getting started with Elixir, start here. If you want to connect with a community of Elixir programmers, I would recommend to join the Elixir Slack group. Go (or GOLANG) is created by Google and it’s gaining popularity which will only grow in 2018. It compiles fast and it has an excellent standard library that is also great with concurrent programs as well. Sites that use GO are: Netflix, YouTube and Adobe. If you are interested in Go, start with A Tour of Go. This official resource walks you through the basics and covers control flow, methods, concurrency, and functions. If you want to dive deeper, check our their blog and their Effective Go, which dives deeper into the Go language. Start with A Tour of Go: it’s a walkthrough of the language in your browser, starting with the basics and covering control flow, functions, methods, interfaces, and concurrency. C# (‘see-sharp’) is not only limited to the programming language for Microsoft’s .NET Framework. It’s also used for Windows applications and Android/iOS Apps with the technology from Xamarin. Version 7.2 is their new release. You can read more about the features here. Pluralsight offers a variety of courses on C# for every skill level. They also have 6 different courses for advanced C# programmers with topics ranging from “Asynchronous Programming” to “Concurrent Collections”. Pluralsight is more expensive than the Microsoft offerings, but many programmers like the instructors at Pluralsight. 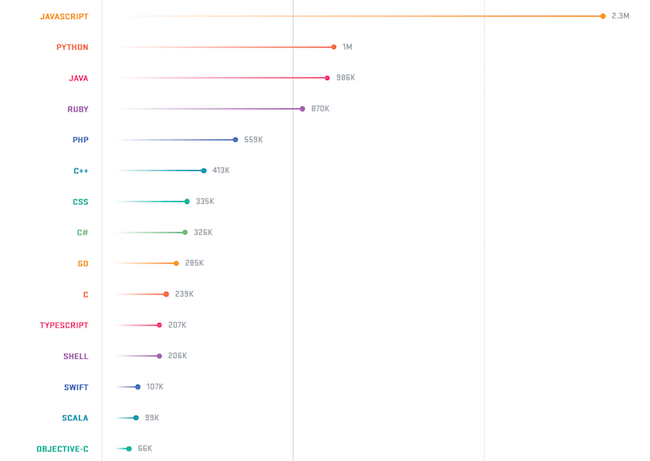 Swift is one of the fastest growing programming languages in history! It’s built by Apple and they have big plans for it so it would be good to take note of it as the popularity grows. Swift is what you learn if you’d like to become an iOS App Developer. Their latest release is 4.0 which you can take a look at here. A tour of the language. A detailed guide delving into each language feature. A formal reference for the language. Learn HTML, CSS, Bootstrap, TypeScript, and 2 backend languages that you prefer. Notable mentions are Node.js, React.js, and Redux. The good news is that learning a new programming language has never been easier. As we exemplified, there are tons of free or low-cost resources out there supporting you no matter if you are a beginner or an expert. Vote Here: What is your favorite programming Language in 2018? I know, I talked about the best programming languages for 2018, but I want to give you a heads-up on Usersnap, which is a great bug tracking- & testing tool. It is used by startups, as well as companies like Facebook, Google, and Microsoft.